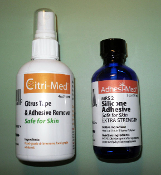 Our Adhesi-Med (TM) skin-safe instant silicone adhesive and Citri-Med (TM) Citrus Tape & Adhesive Remover in one great package. To use Adhesi-Med, simply brush a small amount to the glans area, and wait 30 seconds for adhesive to become tacky. Then simply roll skin over glans. The skin will remain covering the glans all day. The skin is easily pulled back in the event you no longer wish to retain. For greater holding power apply Adhesi-Med to both the shaft skin and glans. People with very sensitive skin may find Adhesi-Med irritating if adhesive comes in contact with glans/musosal tissue. We recommend that those people not apply adhesive directly to the glans. Instead, apply adhesive to device or shaft skin, allow to dry, then attach, or roll skin over glans if retaining. Once adhesive fully dries it is pure silicone and should not cause irritation. We recommend first time users test a small area first before applying to glans. Adhesi-med should not be irritating on external skin areas. Adhesi-Med is a brush-on application. Brush-on applicator included. Keep bottle closed when not in use. Hundreds of applications per 2 ounce (59ml) bottle, it costs only pennies per day to use. A small amount of adhesive residue will remain after skin retraction, which is easily removed with Citri-Med Citrus Removal Spray, which is included. Citri-Med Citrus Removal spray is made entirely from food grade citrus extracts. Adhesi-Med works with our Super Canister Tuggers to eliminate the inner piece of tape. Simply apply a light coating on the end, allow to set, and roll skin up onto device. Secure with outer wrap of tape. Once you try Adhesi-Med , you will say "It's Truly A Miracle"
Adhesi-Med and Citri-Med are (TM) trademarks of Advanced Devices Inc.